Trying to go with more natural cleaning supplies has meant I end up with lots of items that will last me a long time. Or – when you have something fail, like my laundry detergent recently did – you are left wondering how to use up all of your borax. Then a friend told me I could use it as a borax soap scum bathtub cleaner. Turns out, she was right! This blog post contains affiliate links. Please read my entire disclosure here. As you can see in the before picture, my husband’s bathroom had a LOT of soap scum built up. Check out that nastiness in the upper part of the picture! It’s been like that since we’ve moved in. Being we live in an apartment, I don’t want to think about what the last tenant’s were like. Eek! 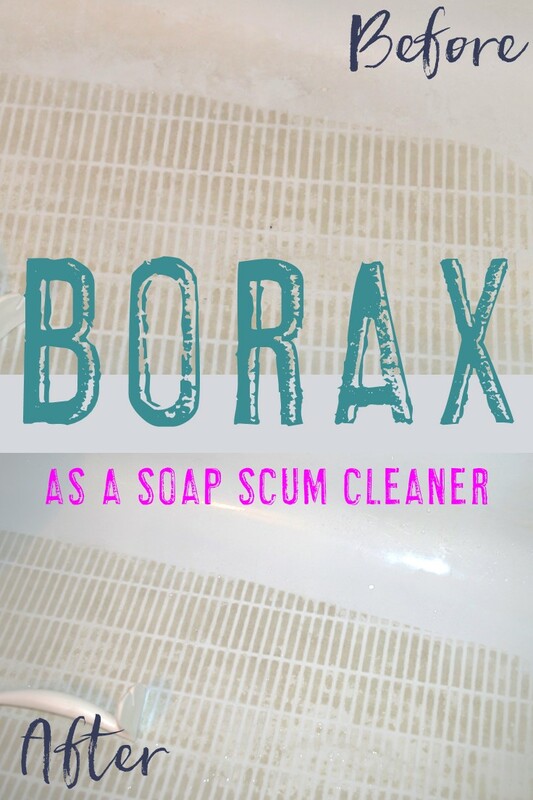 We’ve tried various cleaners with no luck, so I figured I had nothing to lose by trying borax. I sprinkled a little borax directly in the bathtub. I basically gave the entire tub a thin coat. Then I added just a little bit of water and scrubbed with a brush similar to this one. I am not kidding at all when I say that the soap scum instantly started rubbing away! It was almost as if a magic trick was happening right before my eyes! I was giving it a good scrub, but definitely not breaking a sweat. That was motivation enough to keep me going! Typically when I’m cleaning I lose interest quickly because I can’t even tell that I’m making a difference. This time, however, I could see the difference right before my eyes! In about ten minutes time my husband’s tub was soap scum free! In case you’re wondering, I can pick up Borax in the laundry area at my local grocery store. Or you can also purchase it here on Amazon. It actually says right on it that it’s a multi purpose household cleaner. Who would have guessed? 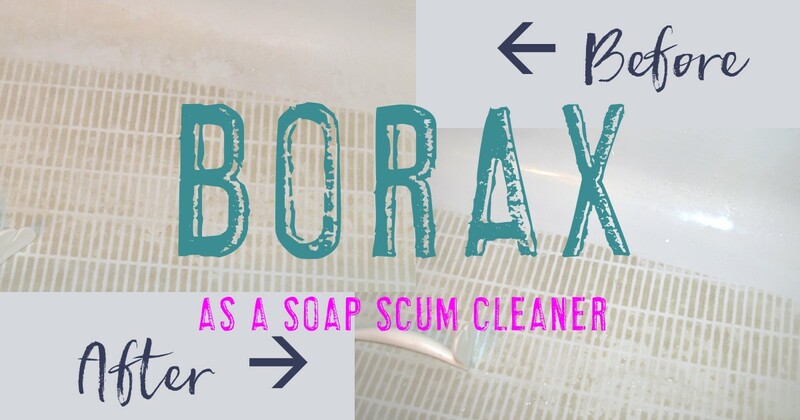 Now I don’t know what I’d do without my borax soap scum bathtub cleaner! Are you living a more natural lifestyle? Then you may want to consider essential oils! I’d love to have you as part of my team. Click here to learn more! I am going to buy some next trip to town..Hope it works as my tub is “clean” but needs to find its shine again..